I received a call from a gentleman that had been on a Ferrari Owners Rally for charity. The rally left Marin County, crossed the Golden Gate, lunched at Post Ranch Inn near Big Sur and ended in Beverly Hills. Not wanting to drive his Ferrari 612 Scaglietti back, he called a tow service. Seems the tow service did not strap it down properly and the car fell off the truck, hit a fence and a parked BMW. I was called by the owner to determine the Diminished Value of the Scaglietti after the repairs had been completed. Based on the severity of damage and the change in value because of the accident the Ferrari was worth nearly $50k less because of the accident history. We helped the owner with his Diminished Value claim and he was awarded the $50k for the Diminished Value of his car. 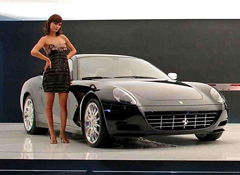 We were praised by our client and have since provided Ferrari appraisals for owners, sellers and buyers.